Last Saturday, I attended the launched of Genki! New Diaper Pants at Sunway Pyramid ice skating rink. The launch was held on Mother's Day. In celebrating the women devote their time and affection to their little bundle of joy, Oji Asia Household Products Sdn Bhd. 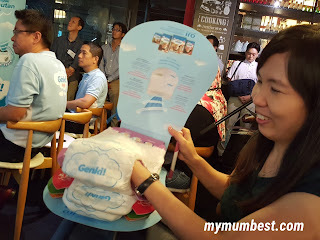 honoured Malaysian mothers in a fun-filled launch and roadshow event. During which, mothers were introduced to the all-new Genki! Pants with amazing cloud-like softness diaper pants. The launched, officiated by the Managing Director and Regional Marketing Director of Oji Asia Household Product, Mr Michael Chew and Ms Lim Hooi Yin. To enliven this special occasion, the company had invited celebrity mum Serena C as the event host, joined by friends and fellow starlet mums Diana Danielle and DJ Gan Mei Yan for a light-hearted sharing session on the tips and tricks of parenting. represented with beautiful bouquet of flowers by Chloe and friends at the launches of new Genki! Pants diaper. Relating their experiences as busy working mothers who must juggle between work and family, every mother shared a common relief that making the right diaper choices is crucial. It not only ensure that the little ones receive the best possible care, but it also reduces messy leakage, rashes, and the need for frequent diaper change. Hence, help lightening up a mother's load. Mr Yoshihiro Yamanaka Finance Director of Oji Asia Household Products. When asked by event host Serena C what does a mother look for in a quality diaper, celebrity mum Diana replied, "After trying out different brands of diapers in the market, I would go for one that offers the softness feel and has great absorbency. Of course, my baby will be the first to let me know if there are issues, and might even indicate which diapers she likes the best." For Gan Mei Yan, a good comfortable diaper should be breathable, highly absorbent and won't restrict baby's movement. She added, "it all comes down to the quality materials used and innovative design of the diaper." Happy baby makes mummy happy is a sentiment all mothers can relate to. One sure-shot way to keep baby happy is by choosing soft and comfortable diaper pants. "Genki" - which means "Happy, Lively and Active" in Japanese - is designed to do just that. mommy blogger Sannie, touching the softness of diaper pants. In efforts to bring a smile to both mother and child, Oji Asia Household Product has conducted in-depth consumer's research to identify what are mums' key expectations of a good performance diaper. The finding showed that an ideal diaper should be soft and comfortable on baby's skin, has excellent breathability and good absorbency. According to Ms Lim Hooi Yin, Regionam Marketing Director of Oji Asia Household Product, Genki! Pants are developed based on this insight by incorporating the innovative 'All Cushion Touch' and 'Ultra Absorbent Core' features to provide the 'Best Comfort Fit Diaper' for babies. Mothers will certainly find Genki! Pants the easy, convenient and practical solution that best fit their babies' body comfortably, without restricting movement. On the day of launched 2000 Genki! Pants sample packs were given away to mothers and mums-to-be. Kid too had their share of fun by treating themselves to a good helping at their favourite cotton candy booth. Children from Sunway Pyramid Ice Skating Academy managed to tug at the heartstrings of the audience with their amazing performances in adorable cloud costumes. New Genki! Pants come in the sizes of M, L, XL and XXL, catering to babies and toddlers weighting 7-10kg, 9-14kg, 12-17kg and 13 -25kg respectively. Available in Mini, Jumbo and Meg packs at a recommended retail price ranging from RM9.00 to RM40.00 respectively, price indicated includes 6% GST. Bila nak jual For gspp staff? what is gspp staff means? Great for Mommies and Babies! Look so comfy for the Babies. Great brand for diaper.. New one? First time heard of it..
i was in pyramid during this event too :) interesting that they have it at the skating rink area! Any free sample to try ? you need to check Facebook Genki Malaysia to see if there's any. As know now they having the Baby Photo contest. Any free sample to try?